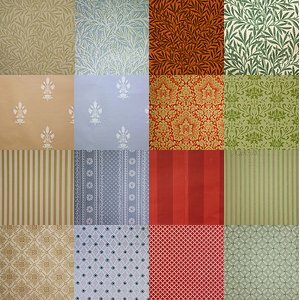 Wallpaper colors and patterns by Waterhouse Wallcoverings. Colors and patterns can have a profound effect on mood. Use these tips to choose wallpaper, and you’ll have an inviting space in no time. Just like with paint, wallpaper colors can be divided into two main categories: “warm” and “cool”. Red, orange, yellow, peach, and pink are classified as “warm”. Warm colors can actually make a room feel warmer. They’re great for rooms that don’t get a lot of light, or when you live in a cold climate.Studies have also shown that warm colors stimulate appetite, which makes them an ideal choice for kitchens and dining areas. Because they’re attention-getters, warm-colored wallpapers are excellent for accent walls. Expect a warm colored room to appear smaller than it is. Blues, greens, aquas, and purples are “cool”. Cool colors are a good choice for warm climates or rooms with a lot of natural light. They promote rest and tranquility; blues, greens, and aquas are especially good choices for bedrooms and bathrooms. Cool colors, especially lighter shades, can make a room appear larger. As a rule of thumb, darker colors make spaces recede. In large rooms, this can lend a cozy feel, but in smaller spaces it can be stifling. Lighter shades reflect light. This makes small spaces seem lighter and windowless areas seem airier. To make ceilings seem higher, paint them a light color, then wallpaper the walls with a darker shade. Choose wallpaper in bright, saturated colors to make a room seem livelier. They’re excellent choices for game rooms, dining areas, or kids’ rooms. Muted colors with a white or gray cast are better for creating a restful environment. Use them in bedrooms and bathrooms. For the best balance, pair light walls with darker furnishings and accessories, and vice versa. Patterns can be very bold, or barely discernible. To make a huge room seem more intimate, use a large pattern, or one with a lot of contrast. Smaller rooms look too busy when covered in huge prints. If you absolutely love a funky floral or giant geometric design, use it as an accent wall in a small room, and leave the other walls a lighter color. The eye will immediately go to the print, creating the illusion of a longer space. Papers with a shimmery finish are another good way to create the illusion of a larger space. Stripes are popular, and depending on how the paper is hung, can be used to create interesting effects. Vertical stripes, especially paired with a light ceiling, make ceilings look a mile high. “Railroading” the paper, or hanging it horizontally, makes the room look wider and longer. If you really want to get crazy, diagonal stripes with neatly mitered corners create tons of visual interest. Stripes work best in rooms where everything is square and level. Check before you buy your paper; if your walls are really wonky, you’ll have better results with a random pattern. Geometrics can be very bold or very sophisticated, depending on the level of contrast. Greater contrasts (like black and white) make a room look smaller. Tone on tone prints provide visual interested without closing in on you. Geometric wallpaper patterns are great for creating a contemporary or art-deco look. Floral and toile prints complement traditional or country schemes. Florals are available in a huge variety of color schemes; toiles are usually black-and-white, red-and-white, or blue-and white. Such an excellent collection wallpaper design, color and pattern. Great thanks for sharing this post. Choosing color is depend on your need whatever you want warm or cool environment. As we have seen in this post that red, yellow and orange shows warm as same blue, aqua and green shows natural and cool environment.